Blacksmiths (c. 1880) by Benjamin Creswick. Iron relief, 10 x 19 inches. Private Collection. Note the three boys peeking through the doorway at left. 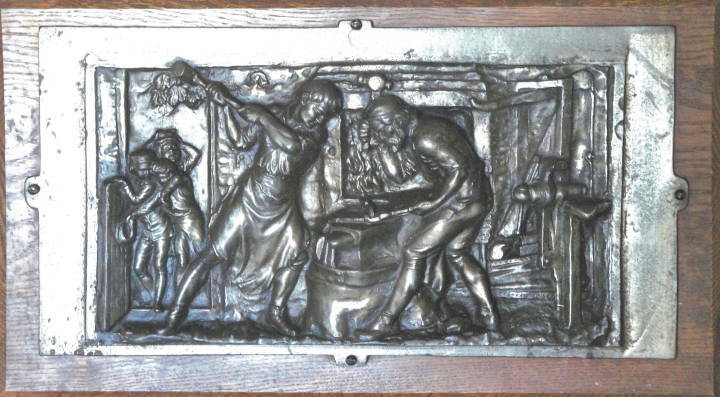 This relief seems to be the one that appears as the central panel of a bronze mantelpiece by Arthur Heygot Mackmurd. Photo and notes by George P. Landow. Reproduced with permission from The Victorian Web.